The BYRD ™ Super Avianti ® Guitar is a multi-patented performance based design which is the result of years of playing experience. The philosophy behind the design was simple: Don't "reinvent" the guitar itself, but reinvent the details which make the difference between a good guitar, and a great one. This means that the Super Avianti ® guitar combines real engineering innovation within the context of a tradition; real guitars made from real wood, and designed by a real guitarist, not a "marketing department". While "plastic" instruments, instruments without a headstock, instruments that weigh 18 pounds (thanks to gimmicks offered as "solutions") may result in photo op's at trade shows, my philosophy doesn't believe these concepts are creating a better instrument, only a different one, and few of them withstand the test of time well. 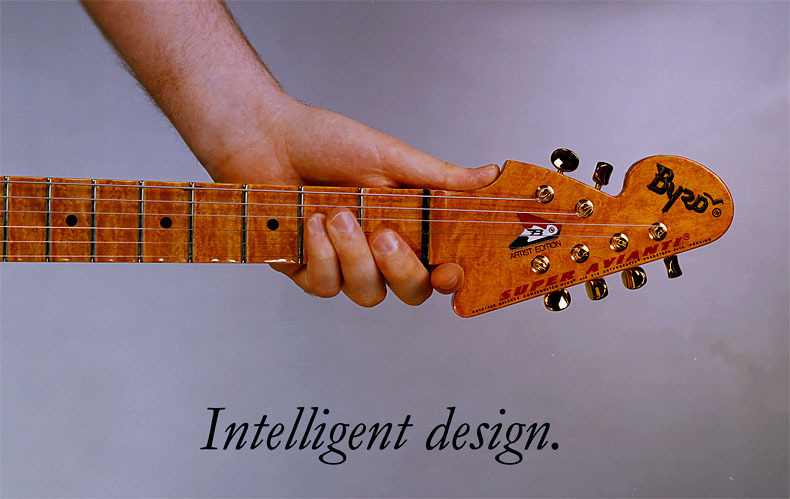 In designing, building, and perfecting 14 prototype instruments over the course of 7 years, to arrive at the patented Super Avianti ® guitar you see here, the decisions and designs arrived at are designed to work. No other guitar I am aware of, has had this much research and design effort put into it, by an actual player in a quest for perfection. 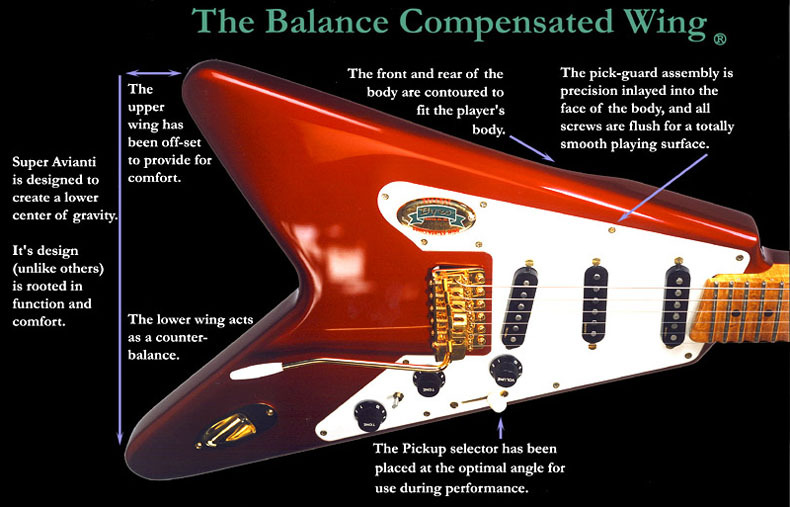 The proprietary Balance Compensated Wing ® design, like each of the instrument's shapes, is rooted in functionality. The concept behind the precision inlaying of the pickguard assembly is to provide a smooth playing surface without sharp edges. While not inexpensive to accomplish, it lends a sensibility and quality to the instrument which is lacking on other instruments. The fitting of the assembly into the precision machined cavity is to a tolerance of .007 thousandths of an inch. In addition to all of this, all of the screws are a solid brass flat-head design, and are individually hand polished, and fully flushed into the pickguard assembly. While other guitars use cheap plated screws which are not flush, the time taken to polish and flush each individual screw, further results in a playing surface free from sharp projections, which I feel have no place on a musical instrument. The use of solid brass -for instruments with gold hardware-, or solid stainless steel -instruments with chromed hardware- also means that unlike plated screws, there is no chance for plating to corrode and lift, possibly cutting the player's hand. The screws can also be re-polished easily if they dull. The material used for the Super Avianti ® pickguard assembly is also different. 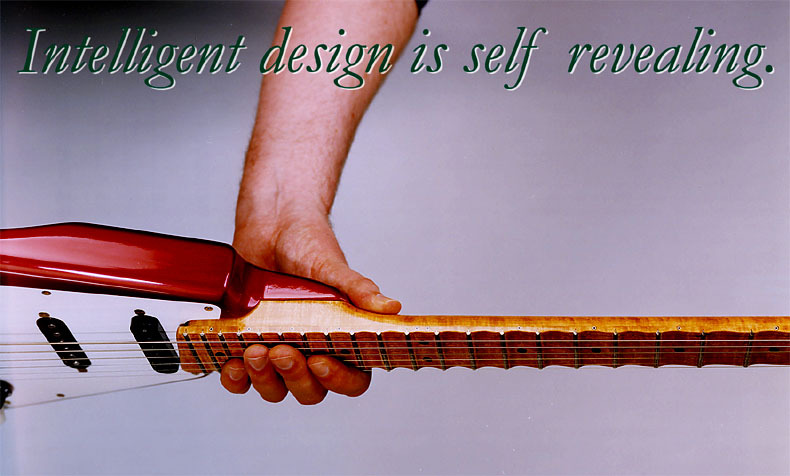 During the construction, testing, and evaluation of 14 prototype instruments, it was determined that ordinary plastic pickguard materials did not have the required stability, tonal properties, or refined appearance desired in an instrument which actually has the pickguard assembly precision inlayed. Super Avianti ® pickguards are computer machined from Acrylite GP ® and are more than twice the thickness of typical pickguard material. In addition to being thicker, the material much harder than other plastics. This was actually found to have a benificial effect on the sound of the instrument, markedly improving the brilliance of it's response. Super Avianti ® guitars use a triple pickup configuration in the tradition of the Fender ® Stratocaster ® . However, unlike the noisy single coil pickups of the original Fender ®, the Super Avianti comes standard with hum-cancelling single-coil style pickups; the Virtual series pickups made by DiMarzio ® which utilize an entirely new technology to acheive true single-coil sound, without the annoying 60 cycle hum prevalent to the Fender ®. These pickups are available in numerous different winds and out-put levels to the customer's individual request, and can create everything from the sound of an original 1954 Strat ®, to the tone of a full-sized humbucking pickup. The tone controls on the Stratocaster ® were installed on the neck and middle pickup. On the Super Avianti ®, two tone controls were also chosen to simplify player adjustments during performance, but instead of placing the first control on the middle pickup -where the original Fender ® decision has been "corrected" for years by customers-, the Super Avianti's ® two tone controls are already installed for the neck and the bridge pickup. Due to the inherintly bright tonality of the single-coil sized pickups, it is felt by most players that being able to shape the tonality of the bridge pickup is a far more important ability than that of the middle pickup. With this design, it is also possible to very closely duplicate the basic sounds of a wide variety of other instruments, resulting in an versitile guitar. For example, with the bridge tone control turned down half way, and with the bridge and neck pickups on at the same time -which the average Strat ® doesn't do- a Byrd ™ Super Avianti ® can even emulate a Les Paul ® very convincingly! Because of the 7 pickup combinations and choices for the tone controls, the Super Avianti ® guitars have the widest range of sounds available in a single instrument, with unparalled simplicity of adjustment. Another superior aspect of the Byrd ™ Super Avianti ® guitar's design is the Orthocarved ™ neck heel. As you can see in the photo above, it's radically different from the Stratocaster's ® old wooden block with a metal plate on top, and it's shaping mirrors the inside of the players hand perfectly. While the Fender practice sped and cheapened production, it was anything but ergonomic and the metal plate was cold, with the bolts in contact with the players hand. The Byrd ™ Orthocarve ™ neck heel uses bolts set into counter-bored attachments points so they are never touched by the player. We also use 5 bolts as opposed to only 4 bolts to improve neck tuning stability and sustain. Why a bolt on neck? First, a well designed bolt-on neck design is tonally superior, providing a demonstrably fuller sounding bass response from the instrument. The reason for this is because a glue joint acts as a "wall" to the transference of resonance between two surfaces, and the neck joint is a critical area of resonance. A properly designed bolt-on neck transfers resonance better than a glued in neck. Secondly, instruments with glued in necks are fragile and subject to easy damage, even from changes in weather or humidity. Artist Edition Super Avianti ® models feature a uniquely scalloped finger board design called U.D.C.™ scalloping ("Use Deliniated Compound" scalloping). What is a scalloped fingerboard? Scalloped fingerboards are carved between the frets to create a playing surface where only the strings themselves are contacted by the players fingers. The players fingers never touch the fingerboard. This offers advantages to the experienced virtuosos: The player experiences drastically reduced friction during string bending and vibrato, and therefore has the potential of increased command of the strings. Playing a scalloped fingerboard guitar is decidedly not for everyone. It requires a very light touch to properly make use of it's benefits or the player will sound markedly out of tune. 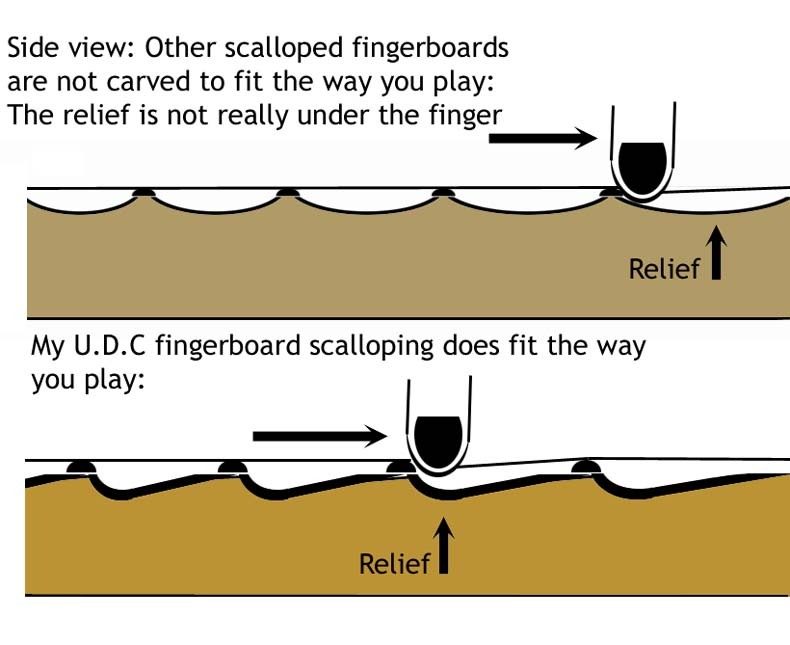 For those who've never played a scalloped fingerboard before, there is a learning curve and it takes a level of pitch awareness to achieve the benefits of scalloped fingerboard playing. For this reason, the scalloped fingerboard is optional and I encourage unindoctrinated players considering it to realize that the feature requires time and consideration to make the most of. You will either love it or hate it, but it will not automatically make every player sound better at first. The U.D.C.™ scalloped fingerboard option is individually and personally carved by me and takes between 6 and ten hours per guitar (depending on whether rosewood or maple is chosen for the fingerboard) to complete. Because I don't anticipate that most players will choose the scalloped fingerboard, production of the feature is extremely limited for the time being. It is personally performed by me on an individual order basis. The shape of the scallops themselves. Rather than a symetrical half-circle of fingerboard wood being scooped out, U.D.C.™ scalloping is carefully engineered and shaped to place the deepest part of the scallop where the player actually puts their fingers; right next to the fret, not in the middle of the space between them. The "U.D.C." in U.D.C. scalloping ™ stands for "Use deliniated compound", meaning that the shape of each individual scallop is determined by the player's use. As the thicker wound strings become a proportionately greater percentage of decreasing distances between the frets, they increasingly are not subject to the player's fingers depressing them beyond fret contact. An additional reason for the design resides in the fact that player's generally use the lower strings far less when playing in the very highest registers of the instrument. Like many of the features on the Super Avianti ® guitars, this refined way of accomplishing things is not a radical departure, but a quality and intelligence of design improvement to be appreciated by those who insist upon something better. It is. The ergonomic Super Avianti ® 2 plus 4 ™ Equa-pull ™ patented headstock is also a unique bit of engineering based upon experiance, reason, and an understanding of physics. While other manufacters have upon occasion, placed 4 tuning machines on one side of the headstock, and 2 tuning machines on the other, the Super Avianti's ® headstock is the only design which places the the four higher strings, into a reversed configuration. A standard 6 on-a-side headstock design (such as Fender's ®) creates several problems as a design: Because the wound strings are dependant upon a solid inner core and they are tuned lower, the wound strings are actually under lower tension than the unwound strings according to their true "modulus of elasticity". It is also known as a fact of physics, that when any string of a given pitch, has it's length increased, the actual tension required to maintain it's pitch goes up. This means that a standard 6 on-a-side headstock design is actually backwards, if the goal of the design is to equalize the tension between the strings. Mine is. Jimi Hendrix intuitively understood this, and chose to live with the awkwardness of playing his guitar upside down for the benefit, because when the design is reversed, bending the higher strings becomes easier, and the tremelo arm has a more equal effective range between the strings. But there are also problems created when mearly reversing a standard 6 on-a-side headstock design: The nearly 8 inches of string length behind the nut on the low 'E' string, then requires that string retainers be placed over the wound strings to keep them from jumping off of the nut. This causes major tuning stability problems, especially when using the tremelo. The Byrd™ 2 plus 4™ Equa-pull™ Headstock design solves these problems, and places the four strings which are most commonly used to play chord voicings which the tremelo arm may be applied to, into the best configuration for optimal tremelo performance. A standard 6 on-a-side headstock design generally only provides 1/2 to one whole step range of pitch when using the tremelo arm. The 2 plus 4™ Equa-pull™ headstock design increases the available range of pitch change with the tremelo to a full musical fifth on the high 'E' string when using the tremelo. The lowered tension on the high 'E' string also makes string bending markedly easier than it is on a Strat ®. Placing the low 'E' and 'A' strings on the other side of the headstock eliminated any need for string-trees, while retaining the most useful elements and performance improvements of the left-handed tuner configuration on the 4 higher strings. You will also notice that the headstock is a "straight-pull" design, meaning that the path of the strings remains perfectly straight from the bridge to the tuning machines. This too eliminates any chance of the strings catching on the nut and creating tuning instability. Just to make certain, a super slippery graphite nut is employed. Between the improved string tension balance, lack of string trees, straight pull design, and graphite nut, the Super Avianti ® stays in tune without a locking nut. While the locking tremelo was a brilliant innovation, it made string changing a pain, and it had a negative effect on an instrument's tone. The improved equalization of string tension of the The Byrd ™ 2 plus 4 ™ Equa-pull ™ Headstock design also results in an instrument which feels better, and is easier to play. One of the questions one might have about the Super Avianti ® guitar design, is why a general 'V' shape was chosen in the first place. There are several reasons, all of them related to specific goals for optimal performance, both from the instrument and the player. From a tonal stand-point, shape is actually very important, even to an electric guitar. You may recall my saying that the neck-joint area of a guitar is a critical area of resonance when I was explaining the reasons a well designed bolt-on neck is actually superior to a glued in neck. This is because the neck joint area is closest to the middle of string length. This means that the strings are at a higher amplitude of vibration at the neck joint, than they are at the bridge. This is why the neck pickup has so much more bass than the bridge pickup on any guitar. A 'V' shaped body design takes "mass" away from the guitar's body at precisely the location where it is desirable for optimal resonance. With lower mass at this critical point, the instrument actually resonates more loudly and has a markedly fuller bottom end to it's tone. The additional mass created by the "wings" behind the bridge, has exactly the opposite effect and exactly that effect is right where we would want it: Placing the additional body mass behind the bridge has the effect of reflecting acoustical energy as opposed to being moved by it. Since the sound we are after is from the strings resonating the body, the combination of lower mass at the neck joint, and higher mass behind the bridge, concentrates the acoustical energy at the most efficient area of the instrument. From a players performance perspective, a generally 'V' shaped instrument has historically had an advantage and a disadvantage. The advantage is obvious to anyone who's played an arpeggio on a Stratocaster ® and banged their left wrist right into the "horn" on the body. The body horns on a standard electric guitar, are in the way of maintaining optimal hand position for playing many musical passages. The Super Avianti ® Balance Compensated Wing ® allows unfettered clear access to the very last fret, without an awkward change of hand position. 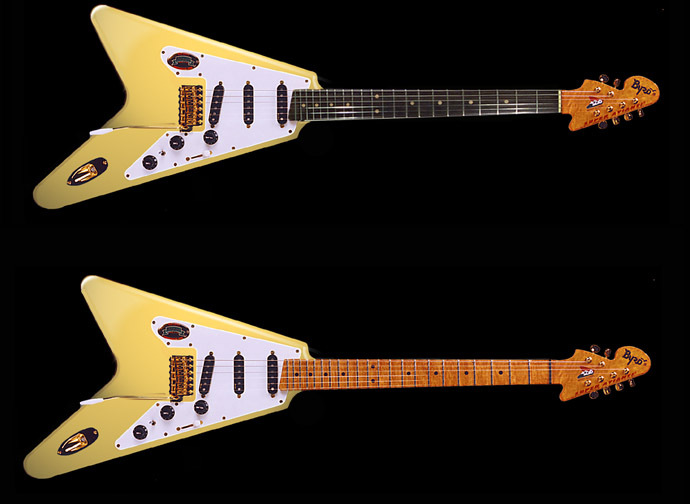 The disadvantages of other 'V' shaped instruments over the years, is that they did not balance properly on a strap, and the equal length of the the two wings, or even worse, the longer upper wing, placed the right arm in an awkward position. By making the upper wing shorter, the Super Avianti ® design has solved both of these problems while keeping the advantages of the 'V' shape. The shorter upper wing compensates for the removal of material in the control cavity, insuring that the lower "wing" is actually several ounces heavier than the upper wing. As a result, the guitar has a center of gravity which is slightly biased below it's center-line, creating an instrument which is stable on the strap and also counter-balancing the weight of the neck. The shorter and fully contoured upper wing also allows the player to assume a proper right arm position in comfort. Neck: Canadian hard-rock figured maple, dual truss-rod, Dunlop #6105 frets, 2 plus 4 ™ Equa-pull ™ headstock, vintage low-mass tuners. Pickups: 3 DiMarzio hum cancelling pickups pickups with 7 way switching, one master volume and two tone controls for neck and bridge pickups. Body: Light weight swamp ash, fully contoured upper wing bout, contoured back, 5 bolt Orthocrave ™ neck heel. *Please see the prices and options page for more information on fret choices and neck shape. Pickups: Single coil hum-cancelling pickups are Standard. Virtual Vintage™ and VirTual™ series pickups by DiMarzio ® are available by option in any choice of model or combination of models. Fingerboard: Flame maple, or rosewood are standard. * Frets: #6105, a tall medium are standard. Artist edition models come with #6000 super-jumbo frets. See the prices and options ordering page for all the neck and fret options. Nut: A low friction graphite nut is standard. Neck wood: All Super Avianti necks are made from figured maple, and are hand selected individually for optimal tone and appearance. Tuning machines: Low-mass vintage tuners are standard. Body wood: 2 Piece Light Swamp Ash with acoustically superior off-set glue seam. Bridge: A six-point "vintage" style tremelo bridge is standard. Pickguards: Egg-shell white Lexan ® is standard. Optional colors and finishes are available upon special request and priced accordingly. Super Avianti ® necks are finished in original nitrocellulose in a vintage honey color to a high gloss. Upon request, the neck may be specified in a satin finish, either on the back, or entirely, at no extra charge. Super Avianti ® bodies are finished in either lacquer, or polyester, depending upon the color chosen and the complexity of any custom work. (c) 2005-2014 Byrd Musical Instrument Company, all rights reserved. The terms "Super Avianti" and "Balance Compensated Wing" are registered trademarks of Byrd Musical Instrument Company. When referencing them, they should be accompanied by the (R) symbol. Prices, specifications, and availability of options are subject to change without notice.